Tabulation machine counting ballots in Hillsborough County's recount room on Nov. 10, 2018. 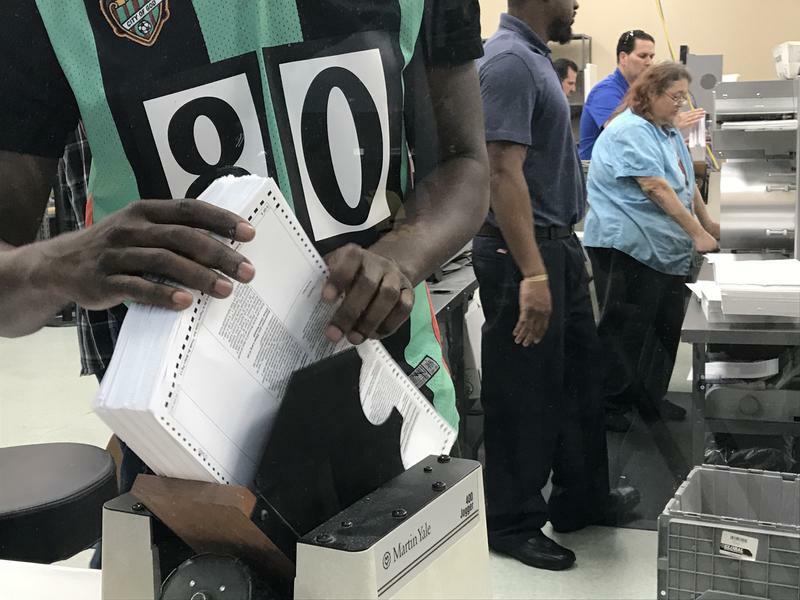 Counties across the Tampa Bay area are racing to meet the required Thursday 3 p.m. deadline to recount votes in three statewide elections. More than a week after Election Day, the results of Florida’s U.S. senator, governor, and agricultural commissioner elections remain undecided. A machine recount was ordered Saturday morning by Florida’s secretary of state, as a result of the tight margins in the three races. Charlotte – Completed. Charlotte County completed their machine recount Wednesday morning. Supervisor of Elections Paul A. Stamoulis said the recount process was “Smooth, seamless, and without incident.” Official results are on their website. Citrus – Completed. Their results only changed by 2 ballots, which they expected due to the ballots getting jammed in the recounting machine. The official results will be posted online by Thursday’s deadline. Supervisor of Elections Susan Gill says she’s prepared for a manual recount, which would be ordered in any race where the candidates are separated by less than .25 of one percent. DeSoto – Completed. DeSoto finished the machine recount Monday. The results were changed by 2 ballots due to human or machine error. The official results of the recount will be posted at their website by Thursday’s deadline. Hardee – Completed. Hardee County completed their recount Tuesday evening. The official results will be available on their website as early as Wednesday morning. Hernando – Ongoing. Hernando County is still recounting ballots. They expect to be done with their recounts by Wednesday evening. They will post the recount on their website once they’re available. Highlands – Ongoing. Officials say they have finished counting Election Day ballots on Tuesday. They are currently counting a combination of absentee, early ballots, and mail-in ballots. They expect to complete the recounting process and have official results on their website by Thursday’s deadline. Hillsborough – Ongoing. Hillsborough County is still in the process of recounting votes. As of Tuesday evening, officials say they have gotten through all of Election Day ballots, a good deal of the early voter ballots, and some of the mail-in ballots. Officials believe they are on track to meet the Thursday deadline, and will post official results of the recount on their website once they've completed the process. Manatee – Ongoing. Despite a hiccup Monday morning due to human error which resulted in the recount process starting over, Manatee officials say the process is proceeding smoothly. They expect to meet Thursday’s deadline and will post official results online when they become available. Pasco – Completed. Pasco County completed their recount process Monday afternoon. Supervisor of Elections Brian Corley says the county workers worked tirelessly through the long weekend, and are prepared for a manual recount if it's ordered. The recount's official results are available here. Pinellas – Ongoing. As of Tuesday morning, Pinellas County is still in the process of recounting ballots. The county has five machines that have to read nearly 450,000 ballots. They expect to be done with their recounts by Tuesday evening, two days ahead of schedule. They will post their official results from the recount on their website once they have completed the process. Polk – Completed. 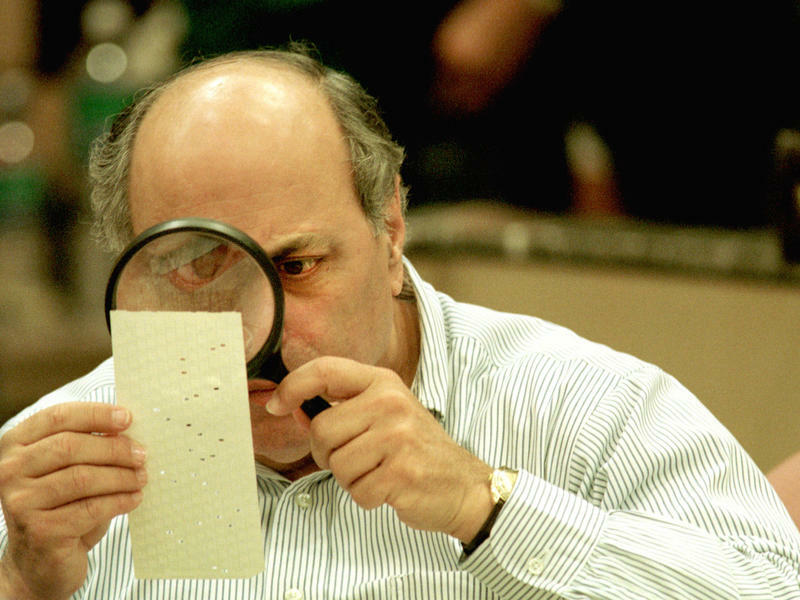 Polk County finished the machine recount. Official results are available on their website. Supervisor of Elections Lori Edwards says they are ready for a manual recount if it’s ordered. Sumter – Completed. Sumter County’s machine recount has been completed, the official results of which are already posted online. In the instance a manual recount is ordered, officials say they are prepared. We will update this story with information about other Tampa Bay area counties as it becomes available. Voter advocacy groups are suing Republican Gov. Rick Scott in Florida’s Senate race. They want Scott to stay out of the ballot counting process.